Continuing the countdown of 2013’s top anti-THR liars, we should not forget that THR is not just about e-cigarettes or people who are rich enough to afford them. Smokeless tobacco is still the leading method for THR in terms of number of users and proven efficacy and effectiveness. The World Health [sic] Organization (WHO) — including its International Agency for Research on Cancer (IARC) and Framework Convention on Tobacco Control (FCTC) units — has long been one of the leading liars about smokeless tobacco. While their lying is not as aggressive as it once was (and thus they rank only third this year in spite of their enormous reach), it is still going strong. This matters because the lies have some influence on the knowledge of people in rich countries — for example, IARC played an important role in tricking people into believing that snus causes cancer to a measurable degree despite the lack of any such evidence. 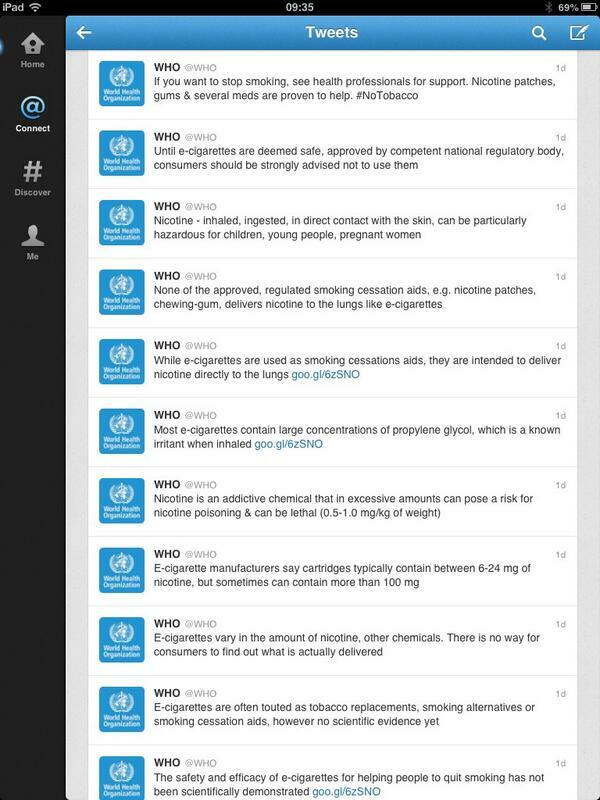 But it matters much more because many poor countries simply take their public health marching orders from the WHO. Among such countries are India and its neighbors, where there is great potential for tobacco harm reduction of a different kind. Millions of people in South Asia use the dip product gutka and others that are similar to it, and these appear to create so much risk of cancer and other oral diseases that their health impact may be up with smoking. The potential harm reduction that would come from persuading people to switch to smokeless tobacco — an obvious substitute that is low-risk and can be affordably manufactured locally — is enormous. The number of users of those products is in the order of a tenth the number of smokers in the world. Enter the WHO, which erroneously claims that these products are smokeless tobacco (tobacco is one of the ingredients, but clearly not the one that is causing the large health impacts). Not only does this basically guarantee that there will be no attempt at harm reduction in South Asia, but it then carries back to the rest of the world that is tricked into believing that smokeless tobacco causes risks similar to gutka. This leads to harmful lies like this, where the claim is that smokeless tobacco is 17% as risky as smoking (the absurdity of making a claim that precise, even beyond the fact that it is wrong by an order of magnitude, is a topic for another day). This tends to discourage smokers from switching to this proven low-risk alternative. Another tribe of semi-liars are the “continuumistas” (not the best neologism meme ever, but useful), those who persist in mistakenly claiming that there is a “continuum of risk” among tobacco products. This relates closely to the above points about different products and comparative risks. The “continuum” claim may have been made more times in 2013 than in all previous history. However, we did not rank the continuumistas on this list because it not really the same as the other lies: While this is often an anti-THR tactic, in many cases it is not intentional and, indeed, many pro-THR commentators make this error. Still, it is important and harmful, so deserves a mention. Some of us have been pointing out for years why this claim is wrong and harmful. For more details, read this, but to summarize the key point: Claiming there is a continuum of risk suggests that tobacco products are spread out across the spectrum from zero up to the risk of cigarettes. If someone believes that is true, they try to fill in the space, and so they dramatically elevate the claimed risk from some products, as with that 17%. The reality is that there are basically just two relevant points: cigarettes and “about zero”. The latter includes smokeless tobacco, NRT, and e-cigarettes, as well as abstinence. The risks from all of these are so close that we cannot measure any differences, and so if you were to graph these risks versus smoking, they would all occupy the same dot on the graph. So what explains the continuumistas in light of that distribution being about as far from continuous as is possible? Some of them are out-and-out anti-THR liars, who are trying to suggest that no one should use the effective and satisfying THR products — or even that such products should be banned — because there is something else that is even lower risk. Historically it was smokeless tobacco that was inaccurately moved into the empty zone between cigarettes and zero, but increasingly it has been e-cigarettes. In many cases this involves absurd made-up numbers (e.g., “smokeless tobacco poses 10% the risk of smoking” or “why reduce your risk by half by switching to vaping when you can eliminate it entirely”), though sometimes it is similarly misleading graphical representations. The claim is also actively perpetuated by industry in an attempt to muddy the waters and distract from the simple message: “combustion = bad for you; all else that currently exists and matters in the marketplace = no measurable risk”. (In fairness, industry is trying to develop some smoking-like products that might occupy that middle space, with much less risk than smoking but more appeal to many smokers who do not like the smoke-free options; still, this does not make the continuum message accurate.) Regulators also tend to like the notion because they like complication, and it keeps them from having to admit that the best choices — which they are often not making — are quite obvious and simple. Finally, many THR supporters who are trying to position themselves as “moderates” seem to like the concept because it lets them avoid stating the highly confrontational implications of the simple message (“we can all agree there is a continuum of risk, right?… aah, good, so we are all on the same page”). But whether used as intentional manipulation, a highly-toxic compromise between the truth and politics, or mere thoughtless repetition, the continuumista message is harmful for THR as a classic case of “the perfect is the enemy of the good”. By suggesting that abstinence is perfect and thus “merely” good alternatives are too far away from it, many people are discouraged from taking the good options that are so close to perfect that the difference does not matter.